Roger Winner’s muddy sneakers kicked up gravel as he paced a driveway at his 650-acre Sunnyside Farm on Wednesday morning. After taking a pull from his cigarette, the third-generation dairy farmer answered his cell phone and repeated a familiar phrase. “I’ve had better days,’ the 57-year-old said, his eyes focusing on a smoking mountain of hay in the distance. Just before sunrise, Winner, his son Damon, and other farm workers were informed by a passer-by on Woodlane Road that smoke was billowing from their dairy farm. Racing back to the smoke, they found a 120-by-60 foot feed barn engulfed in flames. Inside was a $140,000 mower and a year’s worth of alfalfa and oat hay valued at almost $300,000. With 500 Holstein cows producing up to 40,000 pounds of milk daily, Sunnyside is the largest dairy farm in the state, the Winners said. The fire destroyed a huge portion of the cows’ food, which is critical to maintain milk production. 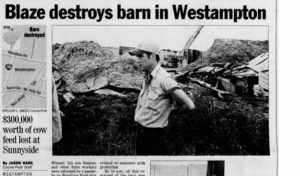 By 10 a.m., all that remained of the barn was twisted aluminum and a 30-foot pile of smoking hay. Damon Winner hoped to salvage some of the feed, but every time he and firefighters dug into the pile, flames ignited once again. A large ladder truck from Mount Laurel sat next to the pile, poised to douse the smoldering hay if it erupted in flames again. Just before noon, a 47-ton excavator arrived to remove the rubble. According to Westampton Township firefighter Wylie Johnson, the fire was reported at 5:52 a.m. and when the first truck arrived five minutes later, the barn was 75 percent engulfed. Johnson said the Burlington County Fire Marshal’s Office would investigate the cause of the blaze. Burlington County Fire Marshal Robert Rose is on vacation and assistant marshals were at a farm fair in Lumberton on Wednesday afternoon. Damon Winner said there was no electric supply to the barn and the diesel-powered mower hadn’t been run in weeks. The National Weather Service, only a few miles from the farm, said they recorded no cloud-to-ground lightning strikes Wednesday morning. Damon Winner spoke of how hard his workers toiled to fill the barn just a week earlier. “We had two cuttings worth in there. We worked all Fourth of July weekend to fill the barn,’ said Winner, sweat dripping beneath his baseball cap. A graduate of Cornell University with a degree in dairy science, Damon Winner said the fire is another hardship the farm will have to face since his great-grandfather Henry opened it in 1909. The farm lost a large milking pen to fire in the late 1960s. Winner valued the current, 10-year-old barn at $65,000. Inside the cow pens, stomachs grumbled as the second of three daily feedings approached. While some feed was saved, Winner said it would be useless if it were too wet. The cows would have to wait for steel ramps to arrive from Willingboro in order to drive the feed truck over a taut five-inch fire hose that stretched hundreds of yards to Woodlane Road. Like many other rural roads in the county, the stretch of Woodlane Road the farm occupies has no fire hydrants, which hampered the firefighting efforts of the half-dozen county departments that responded. Several tankers were forced to fill up from the closest hydrants, return to the scene, and dump their fill into 2,500 gallon pools firefighters erected by the roadside. For Damon and Roger Winner, why the barn burned was less relevant than how their insurance company would calculate their losses. As deep blue rain clouds hung over the field and firefighters wrung sweat from their bandannas, Damon Winner scrambled to keep up the endless cycle of feeding and milking.